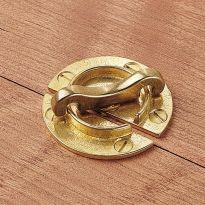 Dual purpose lever lock and striker hardware is perfect for aligning and locking both table leaves and table halves. Performs both functions simultaneously for quick and easy table setups. Purchased and was not proper for the application. With all the connections for keeping the table lined up and even, this is more for safety and looks. A fine product. Easy to install. I recommend this table lock. Only complaint is from a novice woodworking perspective. The spacing of the mounting screws is critical and not explained well on the information sheet downloaded. Align-a-lock is the simplest product I have ever used for such a project. Just follow the online directions and DO NOT RUSH! I made new leaves for my grandmothers oak table and thanks to these locks it is the best now than it was in 1912 when she bought it. These were perfect for the antique table and two leafs! and not the last...they have alot of hardware..if you cant find it they will have it. It worked well and got the job done! This hardware is very nice quality. Well built and sturdy. great product and great service! Just what we needed for our dining table. I used three of these to secure two corn hole boards together for transporting. They are excellent. Can be used for more than tables. The locking mechanism is of professional quality. Works great, we send it to hold the dining room table leaf's tight. Excellent Product, Works As Expected! Took ~10 minutes to install two on a table we purchased on Craigslist. Mechanism moves fluidly. Very satisfied! Needed something hold the leaves of my table together and these were perfect. Easy to install too. Purchased these for an antique table that was made with an extra leaf but it had been long lost. We needed something to keep the two sides of the table together, and purchased these after looking at all the generic hardware stores. 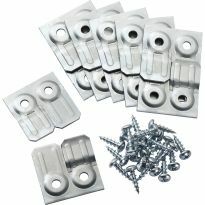 These were great - heavy duty and easy to install. Easy to install. nice strong connection between boards. I am not a great carpenter, but I installed these on my antique dining room table with two leaves. (installed 6 locks.) Easy. Quick, and they work very well. A suggestion; before you install them lube up the rotating and sliding mechanism. It will work much smoother, and you'll like the feel of them after. Was looking in the big box stores for hardware to lock together table leaves - with no luck. I had imagined something similar to window sash locks. After numerous google attempts I was thrilled to find the Align-N-Lock. Better than I had imagined. The added bonus was that in addition to locking they also aligned the leaves. Before installing, download the instructions explaining how to install and align the locks on the leaves. Not complicated. If spaced properly there is slight pressure to pull the leaves tightly together and lock. Very happy with these and would purchase again. I was missing a set of hardware on one side of a table and extension leaf I had purchased. This hardware will replace perfectly what is now missing. Happy to have Rockler to supply what I could not find in the city I where live. Thank You! I had to do a little grinding on them for fitment issues with different table leaves, not a big deal. This little device was exactly what I needed for my very old expandable dining table.Thank you. Worked exactly as advertised. Installation was quick and simple. They are much bigger than I expected them to be. I haven't used them yet and because they are bigger than expected I will not need as many as I purchased. My fault! These worked as I expected. No more gaps. Align and Lock . just as discriptive title these do just that. Easy to use and work great. Keep the table/leaves from opening up. Installation was a snap - took less than an hour. Great product. Tightens and locks table leafs. Perfect item for the job that needed done. Easy to use on both new and old tables to stabilize mating edges. The align-N-lock has worked great for me. I have used them on several tables and have never had a problem with algnment. We have a old oak farmtable, 44" up to 16 feet. Normally use at 7 feet but leaves were constantly shifting a bit and enuf uneven to catch playing cards. Align a lock were easy to install ( with a depth gauge) and cured both problems completely. 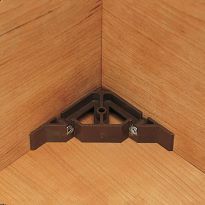 This product is fantastic for connecting 2 desks together, modular tables can be very expensive, however I purchased 6 flat pack desks and used the connectors to lock the desks together to give me the option of one solid boardroom table when I needed it and then modular desks for training sessions. Very simple to assemble, they are a great a solution to a tricky problem. It aligned and lock the table I am building very well. 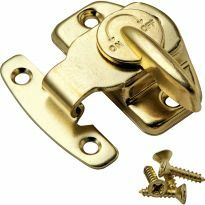 We purchased these locks to repair an old dinning room table that we refurbished. There were not similar locks on the table. These units did just what we wanted them to do. The locks worked fine. Be sure to download the instructions prior to installing. It goes a lot faster knowing the proper mounting. I will recommend this product. Good quality for the money. Rocker appeared to be a good company to order from. They informed me of the availability of the product & delivery. Two leafs in 35 year old oak table ensured the joints were forever separating. Installed one pair with leafs removed, then put one leaf in, installed second matching half of a pair to the leaf, repeated with second leaf. 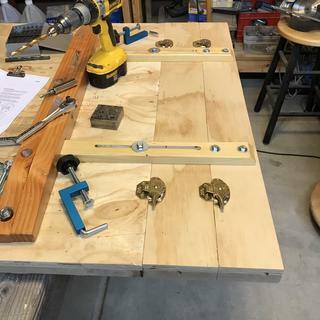 More time spent turning table upside down and handling leafs into position (utilized a blanket to protect table top) three pair of Align-N-Lock, 24 screws (provided with locks) than installing the locks. Installation easy, locks work great. I intend to use on a table with two leaves (with or without leave). So I like the alignment tangs. Also the way the installation is right at the edge of the boards. Easy to install on the table and the leaves. 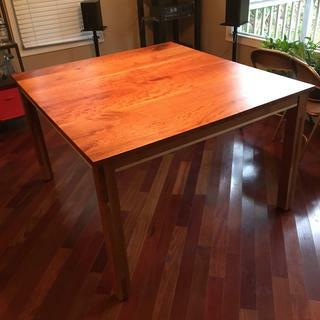 Needed for a table restore project. Item has good reviews. To secure an expandable table top. I am restoring an antique table. 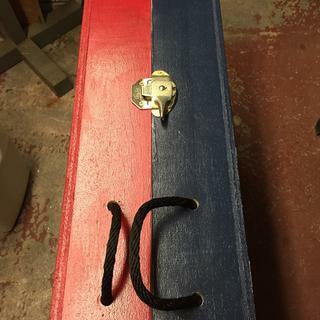 To hold a antique drop leaf table together. Refinishing a old dining room table where the lock had been discarded in the past. To lock two table leaves together. It matches other connectors that I got from you. Works good. Table has no lock and does slide apart in use. It is going on a table that I am making. Have used them before. Easy to install, hold tight. I am using these on a 110 year old heavy solid walnut dining table with 2 leafs. I have a antique table that want stay closed. combines both alignment and lock for extension table with leaves. this simplifies installation. Table leaves would not stay together because there was no locking device. 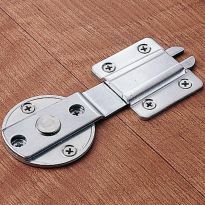 I chose these Align-N-Locks to draw my dining room table leaves together and minimize the gap in the table top surface. I needed these to fix my table and adding these put me over my $35 for free shipping, so why not right? bought a used table and there is nothing holding it together. It keeps opening in the middle. These should be the fix. This lock has the better reviews and the price each is best by far. This style is the best in keeping table leaves snug, tight and aligned properly. To replace the old ones on my 35 year old kitchen table. Was just searching the internet for products to lock a table leaf. Found this and thought I would see if it solves my problem. To replace broken locks on table. 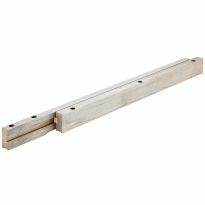 I have a old antique dining table that is kind of loose and i thing these will held keep everything together and aligned. To latch two sides of a drop leaf table together. I am seeking guidance on proper installation. I downloaded the spec sheet for the installation instructions, but made a mistake somewhere in the process. 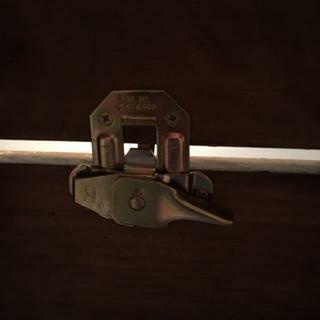 When I try to turn the latch to the lock position, the latch handle doesn't turn all the way. I mounted the base plate flush against the edge of one end of the table. Then I mounted the latch plate on the other piece so that the embossed line is at the opposite edge. Thoughts? I welcome some guidance. I put the table top pieces together, upside down. Then I put the locking mechanism where it was supposed to go (in the LOCKED position), aligned the way you see in the picture. Then it was s simple matter of attaching the screws. Everything worked well. 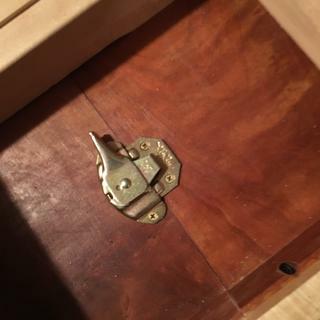 I need a locking device for a very old table with 4 leaves. The original device is missing parts that it hooks onto. BEST ANSWER: Perfect for your job. 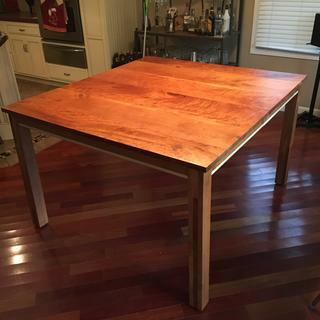 Did basically the same on my drop leaf table only I was lining up two halves with the center leaf missing. I used these to fasten two tables together n our RV. They were easy to install and have held up well. If I have a table with three leaves, but I may use 0 to 3 leaves when the table is set up, can I use these? Will I just have to be careful with the measurements and alignments so that any piece will align with any other piece? BEST ANSWER: Yes, you can use these if, as you say, you are very careful with alignment so that all the locks are positioned identically. I should mention though, that when I bought some, they were so poorly made that some wouldn't lock. I was much happier with several Rockler item 69047 combined with brass alignment bullets. I am using it on a 3 leaf table. They work great, you just get one set up and then set the others off of the first set up. if you do it that way you should have no problem!!! I have a table with one leaf that doesn't fit flush. 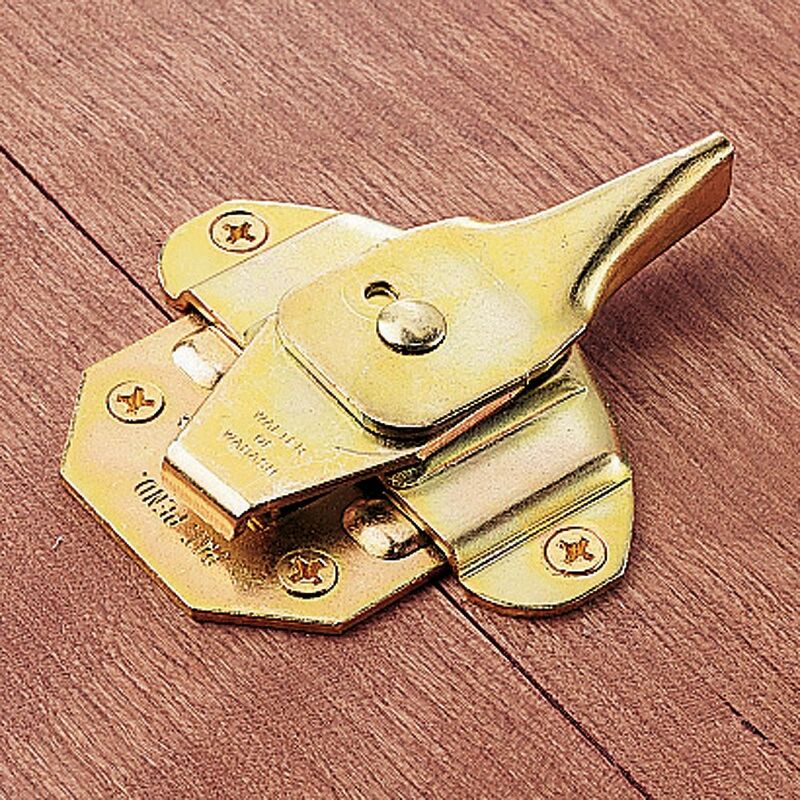 Do I need to purchase two locks, one for each side of the leaf to attach to the table half? This item may help with your issue and I would definitely recommend installing one at each end of the leaf, however, if the leaf is not fitting flush, I would recommend addressing that issue directly first. 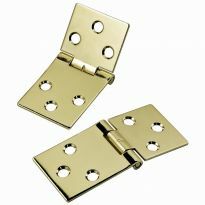 These align-n-locks are designed to work with two pieces that fit flush already, so if it is not fitting flush, every time you go to install the leaf you will have to fight it to get the two halves of the lock to align. If you are talking about a very minimal mis-alignment, you will probably be fine, although you will have to force the leaf up or down just a bit in order to get the lock to mesh. I think you will need to use 2 locks one for each side of the table to make sure the leaf is flush. Just using one in the middle would not make the table leafs flush on the edges. On the table I made I use the table lock in the middle and Rockler Table Leaf Aligners, Item #: 48840, on the outside of the table, one each side. What is the overall height (projection) of this hardware? 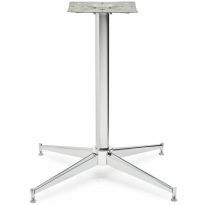 The folding leaf has only 3/4 inch of clearance with the bottom side of the table. BEST ANSWER: The highest point if the handle, and that is a little more than 5/8". It Is less than 3/4". But it will be tight. The farthest point below the table top measures 11/16". I have a table that once the leaf is out it will not fit flush together. Will this work for this problem? BEST ANSWER: There's a chance that it could. It depends on why it doesn't sit flush together though. On my table, i have two of them connected each half and you can set the male piece further away from the female piece so that it pulls it in when you lock it and that would pull both sides of the table together. Yes we bought these to help with holding the leaves tight & the table when the leaves aren't in. They worked really well for us. Will this work on 1/2 or 3/4 plywood to pull snug 2 I/2s of a folding ping pong top that lays on top of a pool table ? BEST ANSWER: It was hard to line up and didn't pull the table leaves really tight. Was most likely due to operator installation. I can't really say if it would work. I don't know why it wouldn't. Measure closely. Bought 2 wooden lazy susan's for a corner cabinet installation in my home kitchen. I am a wife, mommy, and homemaker....NOT a woodworker, so let's start with that to direct the technical level of the responses. :) I measured carefully, it will fit the space inside perfectly, with the 90° notch in the front for the folding cabinet door that folds back into that corner covering the cabinet opening. The lazy susan itself has a ball bearing turntable type mechanism on the bottom so it can be turned full-revolution when you pull out/open cabinet door (it's NOT one of those where the door is stationary and turns with the table/susan.) So, b/c I am NOT a builder or cabinet installer or woodworker, I did not realize -- these two lazy susans I bought were for installation WITH/AT THE SAME TIME AS cabinet installation. Well, the cabinets are there. Countertop is there. There is a stationary (non-removeable, non-adjustable) fixed shelf INSIDE this otherwise open corner cabinet (hence why I bought a lazy susan for top AND bottom.) I want to use them - but lo and behold, they WILL NOT FIT INTO THE OPENING, cannot get the entire susan on its prospective shelf, b/c the cabinet opening is too small, and since these were made to be "built in." SOOO, I had the big idea - of making two parallel cuts through each susan, just around the metal round turning mechanism on the bottom.....then installing some sort of "hinge" underneath, so that now these 2 "leaves" could be folded UP one over the other, on top of the susan....then put into the cabinet, and unfolded - and somehow supported or locked as a table leaf, etc would be. This will serve to hold larger pots and bulky small kitchen appliances, so it needs to be sturdy. 1) What kind of saw needs to be used to cut the susans, as I assume it needs to be a fine cut so as to be flush when opened. 3) what kind of supports or locks underneath? BEST ANSWER: 1. band saw with zero clearance insert to prevent tear out. There should only need to be one cut, to make the parts small enough to fit the opening. You could also consider removing a pie piece section from the shelf, and leave it out. You can then rotate the shelf into the opening, and no other work would be done. 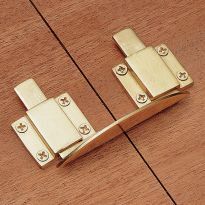 2. hinges need to be on top, or the parts will fold down. any leaf hinge would work, sized for the parts. No supports underneath would be needed.